Marcia Anderson [MD/02] (pictured above left), assistant professor of community health sciences and executive director of Indigenous academic affairs for Ongomiizwin, the Indigenous Institute of Health and Healing, is a Cree-Saulteaux woman who practises internal medicine and public health. The award recognized her leadership in Indigenous medical education and healthcare delivery. Anderson has advocated for a more robust curriculum in Indigenous health and changes to the admissions process to recruit more First Nations, Métis and Inuit medical students. Nirvani Umadat [DMD/11] has provided dental care to remote communities in northern Canada, Southeast Asia and Central and South America. Umadat, who took part in an international scientist-astronaut training program and aspires to travel to outer space, has used her scientific knowledge to inform dental protocols for space science. Two outstanding medical researchers who earned doctorates at the University of Manitoba were selected to network with more than 40 Nobel laureates at a prestigious scientific conference in June 2018. Rushita Bagchi [PhD/16] (pictured above left) and Forough Khadem [PhD/16] were among 600 scientists under the age of 35, representing 84 countries, chosen to participate in the Lindau Nobel Laureate Meeting in Germany. Bagchi and Khadem are the first scientists from U of M to be nominated for the Lindau Meeting by the U of M-based Canadian Student Health Research Forum. They were nominated before completing their doctorates. Bagchi earned her PhD in physiology and pathophysiology in 2016 at the Max Rady College of Medicine. She received the E.L. Drewry Memorial Award, the highest research award given to a senior doctoral student at the college, as well as the St. Boniface Hospital Foundation Award for excellence in research in cardiovascular biology. Khadem earned her PhD in immunology in 2016 at the Max Rady College of Medicine. Her research contributed to new knowledge of host-pathogen interactions in leishmaniasis, a deadly tropical disease, and she identified a novel vaccine/drug candidate against the disease. A U of M-trained physician who became a research pioneer in the field of infectious diseases and an influential faculty member has been honoured with the dedication of a university space in his name. 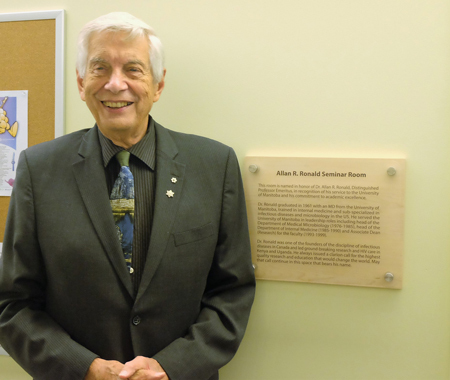 In October, the department of medical microbiology and infectious diseases in the Max Rady College of Medicine officially named a seminar room in recognition of Allan Ronald [MD/61], a distinguished professor emeritus and Canadian Medical Hall of Fame laureate. With Ronald in attendance, a plaque was unveiled. It pays tribute to his service to the university and his commitment to academic excellence.